December 14, 2002, 5:23 p.m.. True human beings, who wish for all mankind love, peace, freedom and harmony, and who do not succumb to the greed for power, self-aggrandizement, arrogance and megalomania, never use hatred, vindictiveness and destructive weapons to subjugate the world and other human beings. In fact, such attitudes, views, and approaches always have the tendency to revert to the contrary. Indeed, thorny, dominating and destructive weeds flourish, sprout and proliferate only where the bloodthirsty warriors of armies have passed through and have murdered, destroyed and annihilated in the name of and under the command of madmen, and under the banner of alleged love, harmony and provision of peace and freedom. Yet truly, all of this is only a pretence to cover up the greed for power, cowardly fear and cowardice, as well as the hatred and vindictiveness of those who instigate wars and create terror and bring unspeakable distress, brutalizing misery and unimaginable suffering upon human beings and the world. Weapons of all types - it started with the striking, cutting and piercing weapons, then came handguns, simple rifles, machine guns, then biological, chemical and nuclear weapons, up to tanks, bombs, rockets and weapons of fatal vibration and radiation - are equivalent to fatal devices and implements bringing death, suffering and pain as well as destruction and annihilation. These can never be a tool or other means of a true human being but only of creatures who are degenerated in the worst form of being human, for whom a human life and everything created and achieved by Creation and human beings has no value. And indeed, creatures who use such implements and weapons to attack, harm and terrorize others and murder as well as destroy, annihilate and conquer out of hatred and bloodthirsty revenge, hardly deserve to be called human beings. In truth, they are worse and more evil than any degenerated bloodthirsty beast. And when human beings are attacked, they have no other choice but to use the same implements and weapons to defend and protect their life, country and achievements, as well as their relatives and belongings. And furthermore, they do good not to celebrate their victory but to remain calm and free of all craving, hatred and wrath, as well as to stay far away from vindictiveness. But should they celebrate instead, then they are no better than their assailants, for they enjoy the victory achieved through massacre, murder and homicide, terror, torture and destruction, annihilation, misery and the contempt of human dignity. In fact, they who celebrate a victory are just as hateful, vindictive, terrorizing, murderous, destructive and bloodthirsty as the assailants. Indeed, the world has no place for the bloodthirsty, the power greedy and the ones who kill, destroy and annihilate through war and terror, for they, being totally degenerated in the worst form of inhumanity, have no entitlement to scrape a living. Human beings who master true love, freedom, harmony and peace do not place themselves in a position of power over their fellow-human beings, for they walk among and identify with them even if they have the leadership, and in this way guide and instruct the people. They are not disposed to militarism or terrorism, and when they in pure defence lead a successful defence and fight a defensive battle they do not go overboard and fall into hatred, revenge, destruction, annihilation, anger and murder. Namely, they understand in every form of human dignity how to maintain the upper hand over the assailant and do not demand reparation out of hatred and revenge. For in their inner self and in their being human they have reached a stage that enables them to be capable of remaining free of these emotions, and free of madness, fury, violence, berserk rage and obstinacy. In fact, greed and wrath, like all forms of the worst inhuman degeneration, are the initial reasons for defeat. Thus, a true victory is attained by the one who is level-headed, restrained, calm and composed, and not by the one who is hot-headed and guided by hatred and revenge or by ambition and the greed for power. The true strategy of defence is acting while truly being unaffected by emotional influences, for this strategy preserves the clarity of thoughts and feelings and humaneness, as well as clear, unambiguous actions whereby any occurrences of degenerations of the worst form of inhumanity are prevented. This kind of defence leads to a superiority, which is not comprehensible by the aggressor, and thus cannot be fought against and eliminated. This is not only applicable in regard to war and defence but also in daily life and in the general and particular relations between human beings when any differences and aggressions occur. In fact, it is important that the strategy of defence remain unfathomable to the human being or enemy one has differences with in order that the defence can be effective. Therefore, the form of defence has to be kept hidden to such an extent that all commands or movements will come as a surprise to the aggressor or opponent so that it becomes impossible for the opponent to take any steps in preparation. And exactly that is the factor necessary in order to be capable of pacifying the fellow-human being or opponent and to teach him/her a lesson for the better or defeat him/her if the applied strategy of defence brings him/her to reason and allows him/her to recognize the effectiveness of the whole. The ability of a human being to create and also gain love, peace, freedom and harmony, rests on the human being's unfathomable wisdom as well as in his/her actions imbued with thoughts and feelings laden with reason. These are values that actually leave no traces because they are formless elements and remain unaffected by everything and are invisible to human beings. Yet as lofty values they are capable of working wonders in the human being and the world if they become effective within and without. However, the wise human being conceals these values in their inner inscrutability, so that they are withheld from the fellow-human being's observance and are effective in their formlessness, and cannot be destroyed by others. The human being is in this way able to be immensely delicate and subtle with his/her thoughts, feelings, hopes, yearnings, ideas and desires, and to reach the boundaries of formlessness without coming to harm. Thereby he/she remains infinitely mysterious and is able to extend to the boundaries of soundlessness without being heard and understood by his/her fellow-human being or opponent, and cannot be harmed and unfairly treated. In this way an advantage is gained, which can open the way to instruct the fellow-human being in forcible forcelessness, or to defeat an opponent without war, terror, murder and manslaughter taking place. So that the words "And there shall be peace on earth" can finally become truth among mankind. The true human being who is imbued with wisdom and lives with the environment in love, peace, harmony and freedom, recognizes a plane of truth that is given by Creation in regard to nature, as well as it knowledge and its resulting essence of wisdom. For this reason a conflict with a fellow-human being cannot come into being and a victory over an opponent and fellow-human being cannot appear in a form that is visible to them. Indeed, that is easily said but extremely difficult to achieve. Because as a rule the human being's selfishness and egoism are far greater and more powerful than his/her reason and willpower to undergo the necessary refinement, which will only be achieved through extremely hard work by a few. A true human being in the fullest sense of the word is able to and has to rely solely on himself/herself in regard to his/her path of evolution and his/her total progress. In every respect the human being bears the responsibility alone, thus he/she alone has to observe and to know everything, which means, he/she has to see, hear, discern and know what other human beings are not able to discern, see, hear and know. That indicates superiority and ingenuity, and exactly through these qualities a progressive and evolutionary gain will be achieved that makes the human being invulnerable and able to defend against all unreasonableness, hatred, vindictiveness, non-love, non-freedom and non-peace. Yet to obtain these virtues the path has to be pursued that leads to resolving the existing problems with fellow-human beings and the environment, which certainly is not an easy process but a very difficult one indeed. Problems of any kind, be it fear, hatred, revenge, cowardice, terror, lust for power and retaliation, or whatever else, cannot and may not be simply filed or buried in one's memory or subconsciousness, with the hope that they simply disappear. In fact, the problems remain existent and maliciously push into the foreground again and again causing uncontrollable harm. In the worst case the consequences will be war, hatred, vindictiveness, murder, greed for power, and striving to gain power; as well as terror, fanaticism, or homicide of the most evil form. To fight against these evil forms of degenerations is more or less unsuccessful. Thus it is not possible to simply file away these problems in one's memory or subconsciousness, for they need a clear resolution and dissolution. The only way that this can happen is by leading the existing problems into an acute state, where their particulars and subtleties can be consciously examined, analysed, cleared up and dissolved. Putting problems into an acute state means that problems -whatever they are, whether they relate to themselves or to a single fellow-human being, or to several of them, or to an entire nation, the environment, or even to the whole of mankind - are tackled in the way whereby they are consciously brought forward and made to exist in the present where they are recognisable and acute. In this way they become highly active and break forth like an explosion. However, that has to happen in a quiescent state, in where the problems that are becoming acute become mobile only in the thoughts and feelings and do not break out externally. The problems, therefore, are not becoming externally effective but are only directed inwards, towards the thoughts, feelings and emotions. And as the problem's eruption takes place consciously occurring only in the inside, since there were no external factors present such as other people, activities, situations, etc., this is called a quiescent state; because quiet prevails externally and the fight only takes place internally. The problems don't have to be fought and overcome in an external condition that is unreal, for they are not externally existent. Thus this process only takes place internally acute in thoughts, feelings and emotions, and can be consciously controlled, analysed, worked upon and dissolved iota for iota. Therefore, all emotions as well as problems of any kind are in an external quiescent state when they are placed into an acute condition in the innermost self. Which is why it is also taught that emotional problems and any other forms of problems can only be worked upon and dissolved in their quiescent state. All emotions, thoughts, feelings and problems of any kind that are consciously and inwardly placed in an acute condition will intensify when they are being analysed and worked upon to achieve dissolution and neutralization. It is possible that the forms of intensity could be much stronger and higher than when they uncontrollably burst to the outside. Therefore, for some human beings, the whole process of overcoming problems will become an almost insurmountable matter when the needed motivation, obtained through instruction by oneself or another person, as well as the necessary will power and initiative, are weakly formed, or non-existent. For this reason, only a few will follow the hard path of cognition and self-knowledge as well as self-realization and will overcome all the evil and wrong within themselves that keeps away true love, freedom and harmony. And if the human being is not able to overcome all the evil and wrong within himself or herself then he or she will not be able to contribute to the situation that enables the individual as well as all mankind to say: "And there shall be peace on earth". Should the human being want to create peace on earth, then each Individual human being has to begin to walk on the path of his/her own inner purification and make a stand against his/her emotions, thoughts and feelings, as well as all his/her problems that relate to hatred, obsession with revenge, fanaticism, sectarianism, religion, desire for power and control, fear, cowardice, addiction and greed, war and terror, murder, torture, capital punishment and obsession with profit, and so forth. He/she has to dissolve and be free of them completely in order to allow true love and harmony as well as peace and freedom to take their due place. And thereby one has to consider that one value cannot exist by itself, for each single value depends on the others. Thus love is dependent on peace, freedom and harmony; harmony is dependent on love, freedom and peace; peace is dependent on love, harmony and freedom as well as freedom on peace, harmony and love. And truly, only all these values combined result in a complete whole that is comprehended by every human being as happiness and joy, and brings pleasure in existing, and, in dignity, a great respect for life. Unfortunately only a small minority knows about the value of love, peace, harmony and freedom and understands their significance in external life and in the life within. For some people, freedom only means that one can do whatever one wants to do or does not want to do. Yet especially in respect to freedom that does not apply. Freedom embodies far more than the individual is able to imagine both in the life within and in the external life. In fact, freedom is not just a general concept for all that a human being does as well as for the fulfillment of all those things, needs, cravings, desires and wishes, which he/she always wants to see fulfiled. Freedom means far more, for among other things it also embodies the actual frankness of the human being that enables him/her to be open and sincere in everything towards himself/herself as well as towards the external environment and his/her fellow-human beings without fear and anxiety, and without having to falsify the facts or having to conceal them to betray himself/herself or his/her fellow- human beings. The year 1968 went down in history worldwide as a year of the peace and love movement. In Switzerland, this movement had its beginning with the so-called Globus-riot that started with a demonstration on Saturday, June 29th 1968, in front of the temporary site of the Globus department store in Zurich. The call to attend the demonstration was done by means of a blue leaflet that included criticism of the government. During the night of June 29th to the 30th, youths and police were engaged in street battles the likes of which had not been seen for decades. A high point of the student and peace movement of the sixties was the 1969 legendary American Woodstock festival, which was attended by about 500000 people, the so-called hippies. The main objective of the participants at this festival was to demonstrate against the norms of society as well as the war which was being fiercely fought in Vietnam at that time. Besides the ideals of peace, freedom and autonomy, drugs also played a large role. The use of drugs was in fact illegal but could not be controlled by the security forces. Taboos and societal rules and statutes were not given any consideration, and many of the participants danced naked through the crowds with the most iridescent colours possible painted on their bodies. Sexuality was likewise not a taboo subject, for the youth culture also rebelled with this subject against societal norms. Another primary concern of the participants in Woodstock was to declare their support for the human being's natural nature. Catchwords like peace, harmony, flower power, rebellion and peace demonstrations went around the world. The so-called flower children spread and proclaimed their peace and free love. The music took on the colour of politics, and was marked by protest singers like Bob Dylan or Joan Baez. But unfortunately history has shown that through demonstrations and festivals for peace, the world could not be changed fundamentally toward the positive and moved forward in its evolution. Our planet has not found peace through these actions and approximately 35 years later many wars as well as murder and terrorism are thriving at proportions that are difficult to assess. Many heroes of the peace movement were swallowed up by their political careers and by power and money. Names like Jerry Rubin have totally disappeared. At first, Rubin was a radical hippie speaker, then became a regular consumer of vitamin pills and according to press reports died early. The music and culture of the 1968 generation remains unseen and unheard by their grandchildren and it has to a large extent fallen into oblivion with the new generations. A prominent symbol that accompanied the so-called Peace and Hippy movement was one that should allegedly stand for peace, love and harmony. 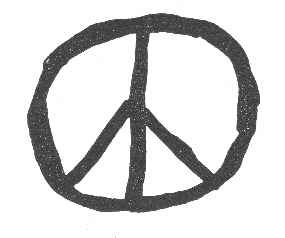 This symbol has become known worldwide as the PEACE symbol. It was to be seen million-fold in all possible colours on banners, flags, jewellery, clothing, on record jackets, or as tattoos. 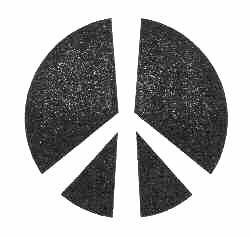 With the passing of the years and the fading away of the Hippy and Peace movement, the PEACE symbol gradually disappeared as well. In recent times, however, this symbol has been and continues to be taken out of obscurity and is encountered with increased frequency. On the website http://www.hippie.ch , the connection to the hippies is unmistakable. Presently, this symbol is also omnipresent on the faces of anti-war demonstrators. On TV it is also used as a substitute for the 'Viva logo'. Many interpretations and speculations are known to exist about the origin and true meaning of this symbol. Attempts to explain the symbol's origin and meaning reach back as far as to the Satanists' edifice of thoughts, where the symbol for peace is used as the symbol for a crow's foot. The Christians used this symbol for the Greek way of writing Christ - a combination of X (Chi) and P (Rho). Another and rather trite explanation offers a different story of the peace symbol's origin. It alleges that the symbol is the combination of two letters from the military's semaphore sign language, the N (standing for nuclear) and D (for disarmament). According to other sources, the British artist and designer Gerald Holtom had designed this symbol with the circle symbolising the earth in 1958 on commission of anti nuclear war opponents. He had allegedly taken the letters from the Semaphore-alphabet (signaller). These letters are depicted with the help of two signalling flags. For each letter and number there exists a unique position of flags. This signalling method is in use in the navy. According to reports, the peace symbol was used for the first time on Easter 1958 at a march in the form of a demonstration from London to a company that manufactured atomic weapons in Aldermaston. Large posters with the PEACE sign were carried by the peace activists. In the sixties in the USA, a broad movement for peace was established in opposition to the Vietnam war. Well known proverbial adages have their origin in that movement, for instance "Make love-not war". The PEACE sign became the symbol of the young generation-PEACE NOW! Shortly afterwards, the symbol appeared in the American civil rights movement of the Sixties. Within a short time, it became internationally known. However, against all popular opinion, this symbol is very much older than generally accepted. The truth is, that the symbol has a completely different meaning and that the story of its origin goes many million years into the past. Many million years ago it was called into existence by Nokodemion, and it carries the meaning of death and the existence in death. In 2004, FIGU published a so-called book of symbols ("Symbole der Geisteslehre") in which some of the ancient symbols of Nokodemion are shown. An interesting fact is that the modern PEACE symbol looks very much like the old symbol for death. However, those who oppose the theory of the symbols' ancient origin only see a pure coincidence in the similarity to the symbol for death, and consider it to be merely a subject for conspiracy theorists. The Nero Cross, respectively the cross for thieves and murders turned upside down. In this story the development of the peace sign leads back to a historical event that happened approximately 1800 years ago. Therefore, the symbol actual1y couldn't have been developed in the twentieth century. According to modern chronology, Nero was the emperor and regent of the Roman Empire of Caesar from 54 to 68 AD. However, these dates are found to differ slightly in various chronicles. The philosopher Seneca is supposed to have had a great influence on the Roman emperor Nero during the years 54 to 59 AD. In world historiography Nero is described as being megalomaniacal, unpredictable, pyromaniacal and psychopathic. In the year 59 he is supposed to have, among other things, murdered his mother Agrippina. Nero was the adopted son of the emperor Claudius, and when the emperor died in the year 53 A.D., Nero married his daughter Octavia. After his stepbrother Britannicus was murdered, Nero quarrelled with his tutor, the philosopher Seneca, leading to a rift. Around the year 62 A.D. Nero allegedly murdered his wife Octavia. During the night of July 18th to 19th 64 AD., a devastating fire broke out in the city of Rome. The fire burned for more than seven days. Historiography speaks of a fire that was used for testing but went out of control due to the wind. According to other records, Tigellinus and other Praetorians were supposed to be the ones who had set the fires following Nero's instructions. It is alleged that the emperor wanted to create space for the Domus Aurea. The cause of the destructive fire of Rome was generally attributed to Nero's megalomania. Therefore he was assumed to be the one who set the fire. At this time, the first Christians began to be organized and believed the words and reports from Peter and Paul, who as so-called apostles, accompanied Jesus Christ, respectively Jmmanuel, on his travels. Notwithstanding the fact that Jmmanuel had never appointed any apostles to teach and instruct, the original teachings of Jmmanuel had already been falsified by Peter and Paul at this time. The Roman citizens and the ruling class of Rome considered the community of these early Christians already in its early stages to be a dangerous sect. Therefore, their members were persecuted. The persecution of the Christians through the emperor Nero was not a fundamental persecution out of religious grounds. According to historiography, Nero rather tried to ward off the suspicion of him having set the fire. The unpopularity of the early Christian minority came in the nick of time. Many Christians were charged with conspiracy and crucified, sewn into bags and thrown to the dogs, or burned as living torches. According to various church fathers in Rome, the two Christian ringleaders Peter and Paul had been executed. Paul as a Roman citizen had been beheaded by the sword, and Peter nailed to the cross. However, according to statements of the Pleiadian/Plejaren, Nero was not the bloodthirsty and pyromaniacal monster that history apparently ascribes him to have been. On the contrary, he was a' victim of treacherous intrigues and devious attacks. Nero died through his own hand several years later. Now, one has to know that at the time of the Roman Empire the cross used for executions had a very different form. However, contrary to all theological opinion and teachings, the Roman cross did not have the well-known form as shown in the portrayal of the crucifixion of Jmmanuel. The condemned person was nailed on a cross with crossbeams slanted upwards in a V-formed angle. This form of cross was used in imitation of the ancient symbol of the tree of life. As a symbol of a tree whose branches reach upwards to the sky. The well known present day form of the Christian cross with an angle of 90 degrees was used much later. As a rule, the condemned person was nailed to the cross with the head pointing upwards, and furthermore, the nails were not driven through the palms of the hands but through the forearms' muscles at the wrist. Also Jmmanuel was nailed to the cross in this way. However, the facts of the matter in the case of the crucifixion of Peter were somewhat different. For very definite reasons he was nailed to the cross in the reverse manner, with his head pointing downwards. Thus, his arms were in a V-formed angle directed to the ground. 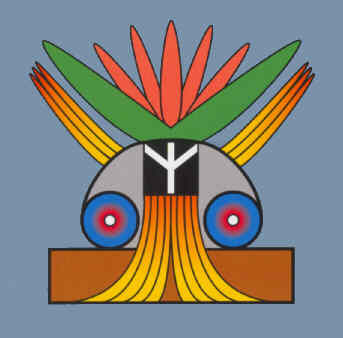 This is also the form as depicted in the so-called PEACE symbol. Legend has it that Nero, through the murder and crucifixion of the ringleader Peter, had referred to peace. Calm and order and therefore peace as well would be restored through the death of the Christian sect's leader. In connection with this event the so-called Nero cross is still spoken of today. In regard to this legend, it is one that truthfully cannot be proven any more. The significance of many old symbols was well known to the Latin citizens of the old Roman Empire. Thus they also knew the significance of the form of the upward positioned crucifixion cross, that it represented the tree of life and that the cross directed downward embodied death. However, the source of their knowledge is no longer clear today. Perhaps the symbol was sketched down over generations, or passed on orally and thus had survived over the centuries. On the other hand it could have been retrieved from the planet's storage banks through unconscious circumstances and actions and then recorded. 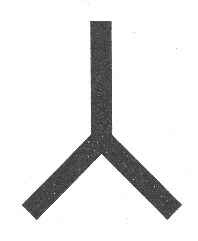 The fact is, however, that different human beings had known about this connection and the symbol's meaning. And for this reason, they deliberately turned the cross for the execution of Peter into the upside down position. By doing so, they symbolized the tree of life's power flowing back into the ground. Thus the life could not strive upward to the sky but had to flow into the soil, into the earth, where it was abandoned to annihilation. The symbol is present in two different symbols. Directed upward and in a double V it symbolizes the tree of life with its branches reaching upwards to the sky, I.e. into the lofty heights. Here, it symbolizes the forces' creational striving towards relative perfection and continuous ascent and making progress. Life can unfold itself in the tree of life. The PEACE symbol with the V directed downward carries within itself the value and the meaning of death as well as the existence in death. The so-called PEACE symbol that is used today is a symbol referring in a twofold manner to incorrect use and wrong interpretation of its original meaning. On the one hand the symbol refers to the tree of life's incorrect use and its 180 degree rotation, and on the other hand it refers to the transformation of the symbol of death and the existence of death into the alleged value of peace. The turned-around tree of life does not let the force of life become effective, but lets the force flow into the ground. In that way life's counterpart is changed to become the annihilator of life. This so-called PEACE symbol symbolizes destruction, annihilation and ruin. It does not refer to death in an evolutionary form, which is striving towards the existence in death and thus fulfilling an important part in the life of a human being. On the contrary, this so-called PEACE symbol refers in its wrong usage to a senseless death, to destruction in a de-evolutionary form. It refers, therefore, to a non-evolutionary senselessness and forced finiteness. And therefore, the so-called PEACE symbol cannot be brought in any way into connection with love, peace and harmony, for blood clings to its forms. Blood of human beings like Peter, who had been forced to endure the burden of death by being murdered and was sent to the beyond in this indescribable and inhuman way of crucifixion. The energy is flowing out of the symbol in the direction of the earth. The energy departs from life, and life becomes powerless like a wilting flower or a human body slowly decaying. All of this means that the human beings of today and the peace movement erroneously identify with an imaginary, incorrect peace symbol and, therefore, in truth court and evoke non-peace and death, disharmony and unkindness as well as war, annihilation, destruction and everything rotten and evil. And truthfully that is because the so-called PEACE symbol used by the human beings is indeed expressing exactly the opposite of peace, harmony and life. Thus in fact it bears senseless death and annihilation. It is recommended to read the brochure 'Predictions of the Prophets Jeremia and Elia'. This brochure refers to the present day and coming world situation and to its development. Detailed and accurate predictions let you know what happens at this time, and what will be happening in the near and distant future. It also tells you how a worldwide peace can be striven for and achieved. Please check for availability* in English.